It's deja vu time at Atletico Madrid as they face another summer of speculation when it comes to the future of their star forward Antoine Griezmann. Less than a year ago the French international made the world wait until he made his decision to remain at Atletico and sign a huge contract with the club. 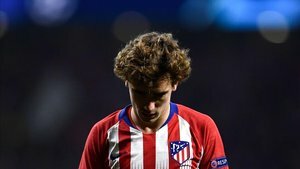 Griezmann decided to stay because he felt the side were ready to challenge for the biggest prizes but this season has gone worse than expected. Atletico are struggling in LaLiga and are out of the Champions League and Copa del Rey. Now Griezmann appears to be doubting the decision he made. Now Atletico have to plan for the possible departure of Griezmann and removing his huge, restrictive salary from their budget. With €23m off the wage bill, it'd allow Diego Simeone to create a new generation of talent at the club. For Andrea Berta, the man in charge of transfers at Atletico, this isn't the ideal market to look for a new superstar striker due to the very limited options available. Perhaps Kalinic, Morata and Diego Costa are enough to secure the goals needed to keep them at the top of the table. Costa, who has been below par this season, is certainly capable of being someone Simeone can build his attack around. "We will speak with Griezmann & he'll have had the necessary time to reflect"
As we know with Griezmann, he won't be in any rush to reveal his cards. He enjoys the suspense and rumours which accompany him on a yearly basis. Last season his failure to commit caused some fans to turn on him and if he begins to do the same this time around then expect a similar, stronger reaction.